Enjoy a free movie screening outdoors. 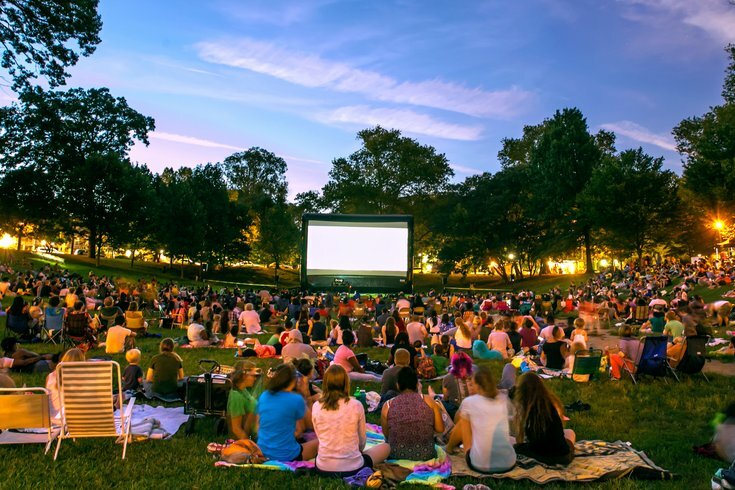 With warm weather comes another season of free outdoor movie screenings in Philadelphia. Parks, beer gardens and other outdoor spaces will turn into theaters, showing a mix of classics, recent releases, family-friendly favorites and Oscar-winners. Below is your go-to guide for what's screening where and when. It will be updated frequently as more summer movie series are announced. The Schmidt's Commons in Northern Liberties will host movie night on Thursdays this spring and summer. Each month, there will be a superhero movie and a movie musical, as well as new releases and nostalgic hits. Remember to bring a chair to enjoy the show. Screenings begin at 7 p.m.
Thursday, May 3 – "Star Wars: The Last Jedi"
Thursday, May 10 – "The Shape of Water"
Thursday, May 17 – "Singin' in the Rain"
Thursday, May 24 – "Thor: Ragnarok"
Thursday, June 7 – "The Greatest Showman"
Thursday, June 14 – "Casablanca"
Thursday, June 21 – "Pitch Perfect 3"
Thursday, June 28 – "Spider-Man: Homecoming"
On select Thursday evenings, you'll be able to watch a movie at the King of Prussia Town Center. Remember to bring a blanket or a lawn chair. Screenings start at 8 p.m.
Thursday, May 17 – "Coco"
Thursday, May 31 – "Wonder"
Thursday, June 28 – "Grease"
Thursday, July 19 – "Up"
Thursday, July 26 – "Jurassic Park"
Thursday, Aug. 23 – "Little Giants"
Beginning in June, La Peg will screen movies in its beer garden beneath the Ben Franklin Bridge. Movies will begin at 8:30 p.m.
Each film will be paired with a special cocktail ($10), which can be purchased at the outdoor bar. In addition, chef-owner Peter Woolsey and his team will offer a summery menu of char-grilled burgers and other seasonal staples perfect for enjoying al fresco before, during or after each screening. Wednesday, June 6 – "Ferris Bueller’s Day Off"
Wednesday, June 13 – "Can’t Hardly Wait"
Wednesday, June 20 – "Mean Girls"
Wednesday, June 27 – "10 Things I Hate About You"
Wednesday, July 11 – "Men in Black"
Wednesday, July 18 – "Con Air"
Wednesday, July 25 – "The Fifth Element"
Wednesday, Aug. 1 – "Moonrise Kingdom"
Wednesday, Aug. 8 – "The Parent Trap"
Wednesday, Aug. 15 – "Wet Hot American Summer"
This movie series will run from June 7 through Aug. 9. Some movies will be screened by the Walnut Street Bridge, while others will be screened by Wharton Street. Remember to bring a blanket or chair. Thursday, June 7 – "Beetlejuice"
Thursday, June 14 – "Going in Style"
Thursday, June 21 – "Ferris Bueller's Day Off"
Thursday, June 28 – "The Fifth Element"
Thursday, July 12 – "Casablanca"
Thursday, July 19 – "Coco"
Thursday, July 26 – "Moana"
Thursday, Aug. 2 – "Black Panther"
Thursday, Aug. 9 – "Silver Linings Playbook"
Head to Mt. Airy for family-friendly flicks this summer. Remember to bring a blanket or chair. Head to the Great Plaza at Penn's Landing to watch a free movie. Movies start at dusk, which is approximately 8:30 p.m. in July and 8 p.m. in August. Thursday, July 5 – "Justice League"
Thursday, July 12 – "Jumanji: Welcome to the Jungle"
Thursday, July 19 – "Mission Impossible III"
Thursday, July 26 – "Star Wars: The Last Jedi"
Thursday, Aug. 2 – "Austin Powers In Goldmember"
Thursday, Aug. 9 – "Black Panther"
Thursday, Aug. 16 "– A Wrinkle In Time"
Thursday, Aug. 23 – "Coco"
Thursday, Aug. 30 – "Despicable Me 3"
Dilworth Park outside City Hall will host outdoor movie nights at 8:30 p.m. this summer. If you get there early, you can join in spoiler-free movie trivia and enjoy the movie soundtrack. Friday, July 20 – "Star Wars: The Last Jedi"
Friday, July 27 – "A Wrinkle in Time"
Friday, Aug. 3 – "Black Panther"
Friday, Aug. 10 – "Ready Player One"
Friday, Aug. 17 – "The Greatest Showman"
Friday, Aug. 24 "Wonder Woman"
Bring chairs or blankets to enjoy a free movie in University City this August. Screenings will begin at 8 p.m.
Friday, Aug. 10 – "Back to the Future"
Friday, Aug. 17 – "Coco"
Friday, Aug. 24 – "A Wrinkle in Time"
Friday, Aug. 31 – "Black Panther"